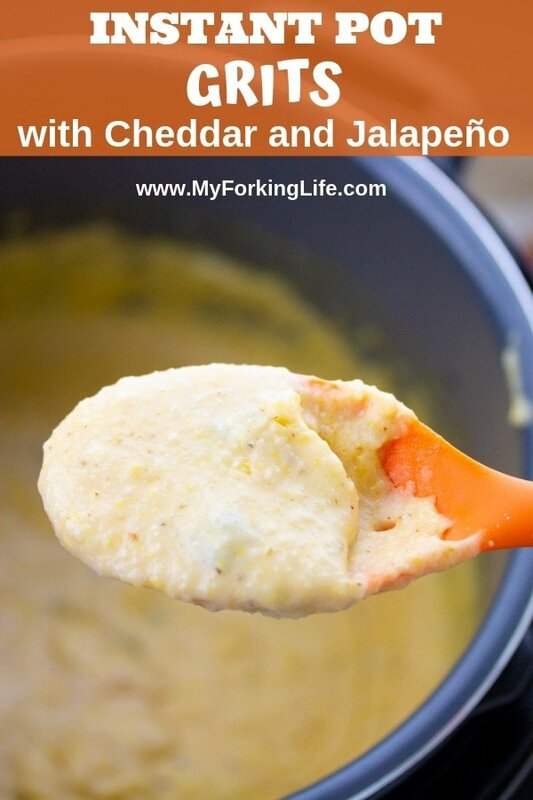 These Creamy Instant Pot Grits with Cheddar and Jalapeño are a delicious addition to your breakfast table. This recipe is so easy to make in your Electric Pressure Cooker. 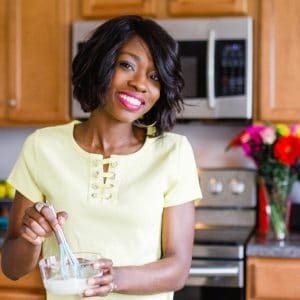 I love making breakfast recipes in my Instant Pot Pressure Cooker. From this egg bite recipe, to pumpkin oatmeal, to even bread pudding. One of my favorite items to eat for breakfast is a good bowl of southern style creamy grits. I like my grits salty and cheesy and served with a side of bacon. I found that the Pressure Cooker was the perfect vessel to make grits. Wait, pressure cooked grits? Yes, it seems bizarre but it works beautifully. You can check out my Ninja Foodi Fish and Grits where I also make grits in a pressure cooker. Always use stone ground grits. They take a little longer to cook but they are creamy and produce the right texture for good Southern Style grits. I don’t use quick cooking grits as I don’t like the texture of them at all. Remeber 1:3:1. 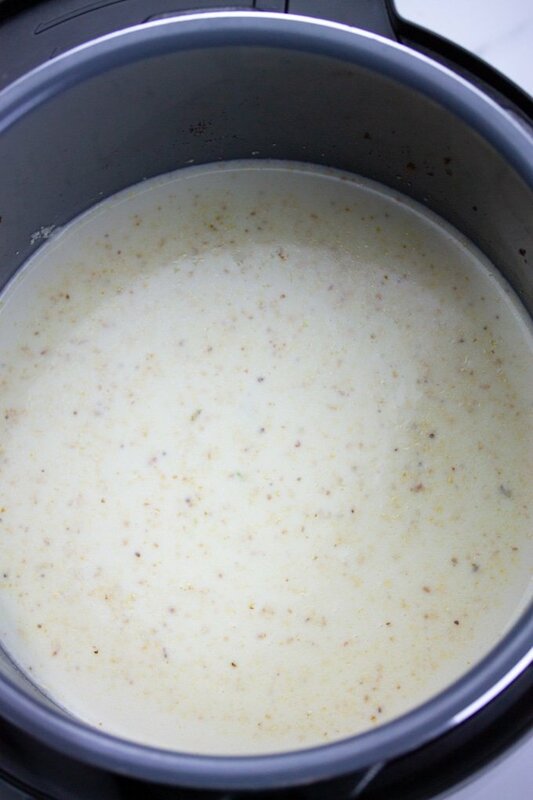 Use 1 part grits, 3 parts water or broth, and 1 part heavy cream to the pressure cooker cycle. 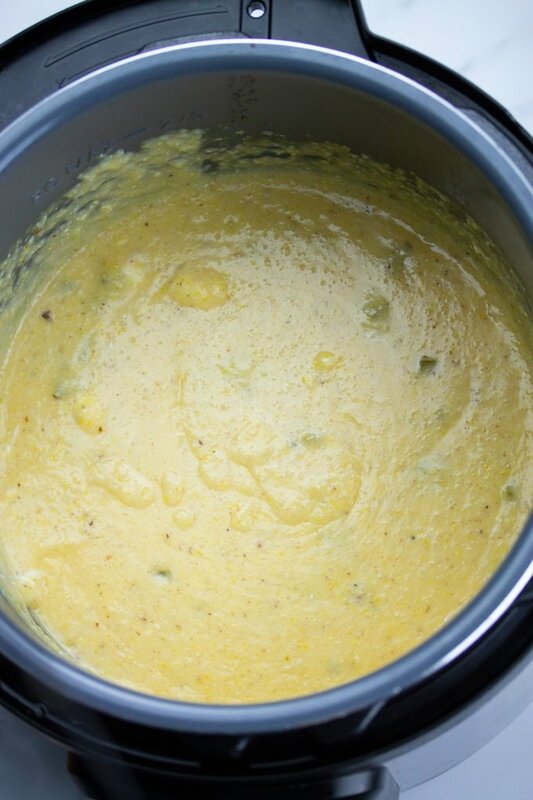 Allow grits to cool for at least 5 minutes once done pressure cooking. This will allow your grits to thicken up to a nice consistency. First, I prepare my ingredients by doing what’s called mise en place. 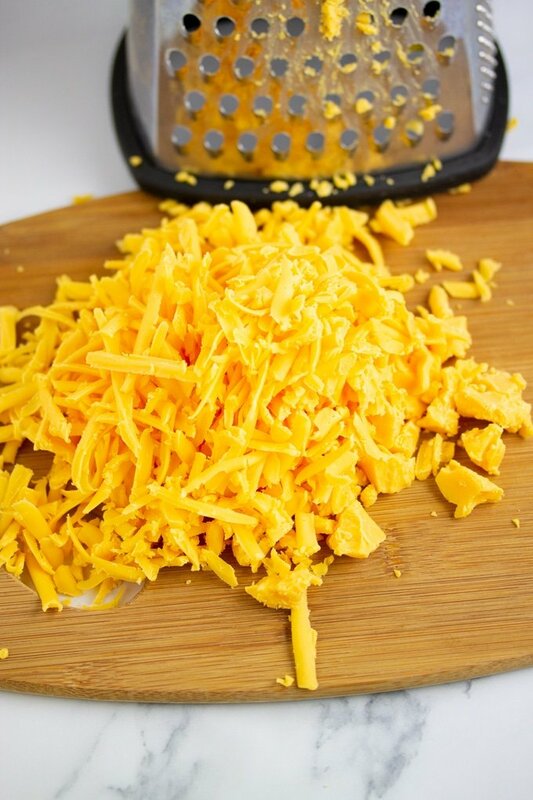 I grab a block of sharp cheddar cheese and I shred it, then set aside. I tend to buy block cheese rather than pre-grated cheese for all my recipes because I find it melts a little better. However, pre-grated sharp cheddar cheese will work fine in this recipe. 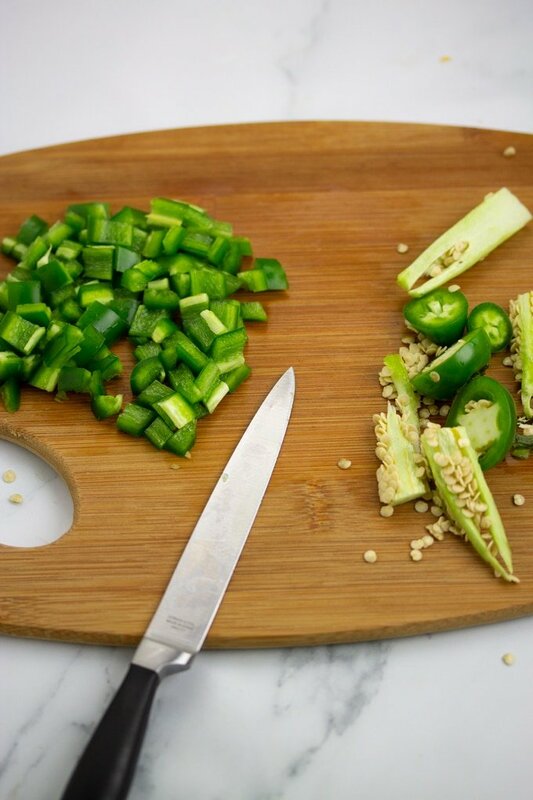 Then prepare your jalapeños by removing the seeds and white membranes and chopping it. The spices of a pepper live in the seeds and the white membrane, removing them will remove the extra spice. 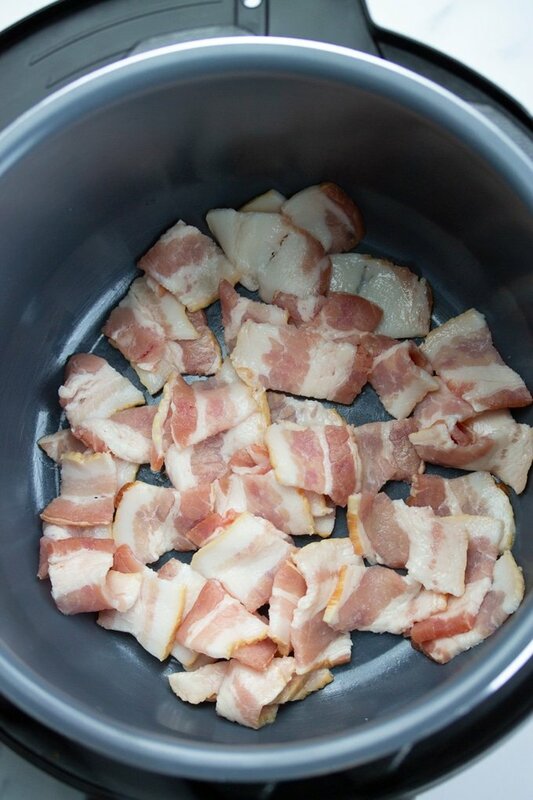 Add chopped bacon to your Instant pot insert. Then turn your Instant Pot sauté function on the “Normal” setting by pressing the “Sauté” button a few times. Bacon cooks best when it’s added to a cold pan and is cooked over a low temperature. I usually crank that Sauté function up to the highest setting but that would actually result in burnt bacon. So for this recipe, reduce the the sauté function. You can reduce the Sauté function on your Instant Pot by pressing the Sauté button a few times. Once your bacon is cooked and crispy, which takes about 15 minutes, remove it and place it on a paper towel to drain. 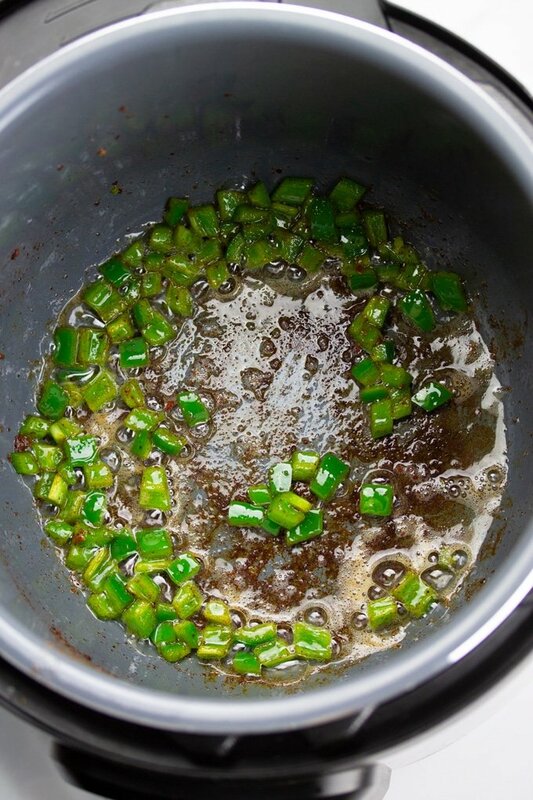 Remove the excess grease from the Instant Pot, leavung about 2 Tbsp in the pot. Add jalapeño and sauté for about two minutes. Add stone ground grits, and stir for about 10 seconds. Add water and use a wooden spoon to get up any brown bacon bits on the bottom of the pot. Then stir in your heavy cream and a little salt. Cover and cook on high pressure for 10 minutes, allow to natural release for 10 minutes, the manually release any remaining pressure. Open lid and add cheddar cheese and cream cheese and stir until incorporated. Your grits will look a bit watery initially. Allow them to cool for about 5 minutes before serving. If you don’t want to make a huge batch of grits, pot in pot works fine for this recipe. Just cut it in half and use a smaller bowl with a trivet. You could also store this recipe in your refrigerator and reheat it the next day. I put mine in the microwave for about 1-1:30 minutes. These Creamy Instant Pot Grits with Cheddar and Jalapeño are a delicious addition to your breakfast table. This recipe easy and all made in your Electric Pressure Cooker. Add bacon to insert. Turn on Sauté function and select “Normal” heat. Allow bacon to sit undisturbed until it gets cooked on one side, about 8 minutes. Then stir your bacon pieces until all pieces are cooked. Remove from insert and place on a paper towel to drain. Remove excess bacon grease from Instant Pot, leaving about 2 Tbsp. Add chopped jalapeño to the insert and stir until softened, about 2 minutes. Add grits and stir for about 10 seconds. Add water and use wooden spoon to stir up any brown bacon bits stuck to the bottom of the pan. Stir in heavy cream and salt. Press Cancel on your instant Pot. Then select “Pressure Cook” and cook on High Pressure for 10 minutes. Once done, allow your Pressure Cooker to natural release for 10 minutes, then manually release any remaining pressure. Open lid and stir in cheddar cheese and cream cheese. Allow grits to cool for 5 minutes. Block cheese that is grated by hand works best. When cutting jalapeño, remove the seeds and white mebrane. The spice lives there. You can leave a few seeds if you want your grits spicy but I use the jalapeño for flavor, not for the added spice. I know there is a ton of different info on whether you can add heavy cream to a pressure cooker during the pressure cooker cycle. That will always depend on the recipe and the fat content of your cream. I recommend full fat heavy cream. The cream in this recipe will not curdle in your pot. You can skip the bacon step and use 2 Tbsp of butter if you like. I like to add crumbled breakfast sausage into my cheesy grits. So yummy! Thanks for the Instant Pot recipe! 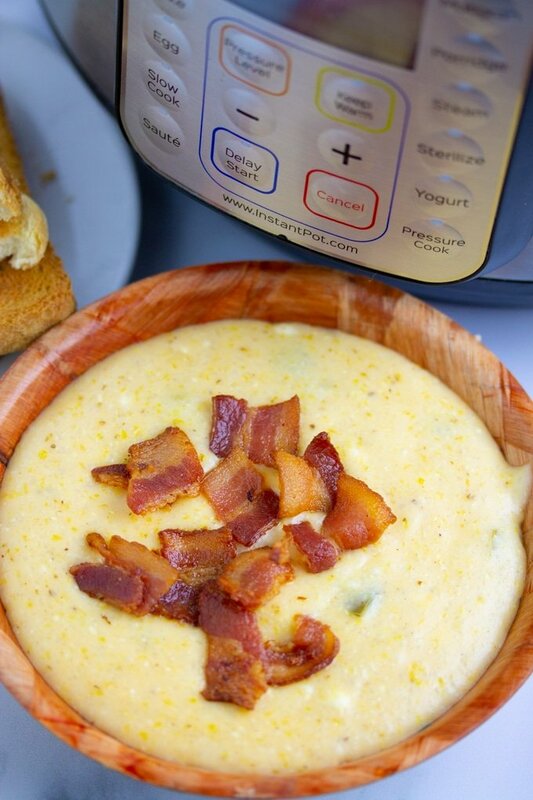 I would love to try cheesy grits in my Instant Pot. However, I cannot eat the bacon and jalapeños. What modifications do you advise without sautéing the grits in bacon grease? Would I need to add more liquid? I want to make these for houseguests this weekend. Thank you! 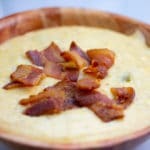 Yum, my mom loves grits so I think I’ll have to make these for her.I know she would love this. Be still my grits loving heart! Great step by step instructions. Can’t wait to try these! Instant pot grits? Omg, this looks so delicious and perfect. I love the creaminess and need to make this asap! Oh yum!! Definitely pinning these!! 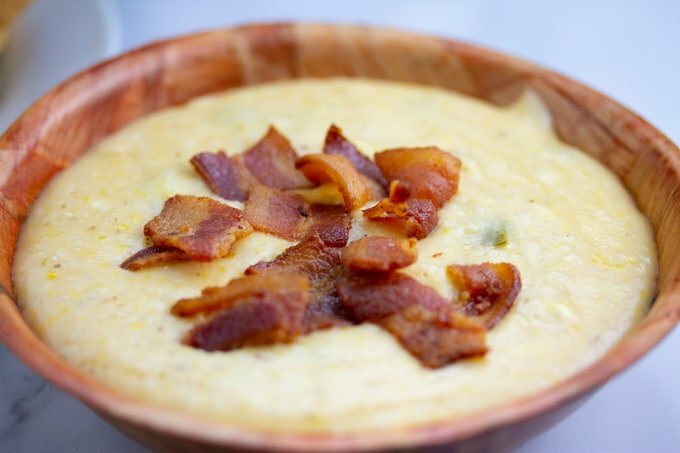 I don’t make grits very often, but this recipe is making my stomach growl, it looks so delicious. I also love any excuse to break out my Instant Pot! I’ve never actually had grits, but always been intrigued. I love the sound of the jalapeno there to jazz it up!